Once you create a user profile on Motifator and update with the appropriate information, the updates shown here will be specific to you. Old Motifator threads are available in the Archive. Viewing topic "ALL File from Motif XF7 to MODX7"
I tried to load my ALL File from my Motif XF7 into a new MODX7. I formatted the USB Stick and then added the ALL File to the Stick and then it Loaded into the MODX Ok.. but I don’t see the Performances that I’ve made over the years on the MODX… I only see the individual Voices. 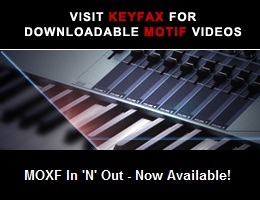 How can I find and play all my Motif Performances on the MODX? I’d hate to have to start over and make all new performances again. Your question isn’t about using the Motif XF, it concerns using the MODX with an XF file. Sorry, but Motifator isn’t currently supporting the MODX. I loaded only the voices by error and not the Performances. Sorry to post in here re MODX, but I didn’t know where else to ask.